They say that drugs affect your mind and destroy brain cells. In this case it was probably true, but truthfully, I’m not sure he had too many to start with. An East Hartford, Connecticutt man called police to report he had been robbed while trying to buy crack cocaine. You can tell already, this plan is flawed. Max Minnefield called police Monday to tell them he had paid a man and a woman $8 for drugs he never received. Maybe he should have called Walmart. Police charged him with criminal attempt to commit possession of narcotics. During his arraignment Tuesday, Judge Bradford Ward asked Minnefield, “Did you really think the police were going to go after the people?” He added that his question was rhetorical. Well, considering they were suppossed to be dealing, they might want ot consider it. Prosecutors later dropped the charges. Laura Weslund, Minnefield’s public defender, said no drugs were ever found. Of course not, he never got them. This story is just full of brilliant deductions. Sometimes nature can play strange tricks. This one is pretty cool. 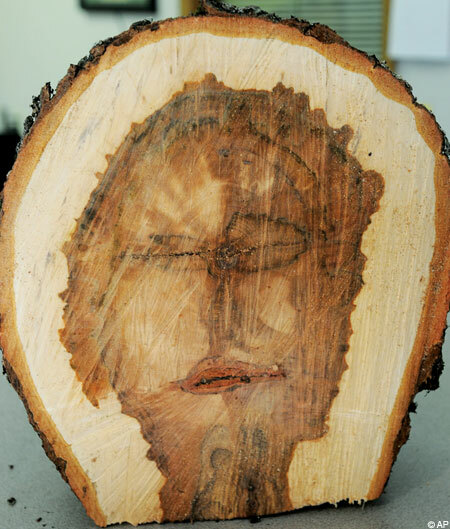 The face-tree was brought into the Daily Times newspaper in Maryville, Tennessee on Monday, by Ernest Ward, a groundskeeper at the local Magnolia Cemetery. Ward said it was found on Monday as he and co-workers cleaned up debris from a weekend storm. According to him, a former worker at the cemetery believes the face is a spirit. If it is a spirit, you just cut it in half, how do you think it feels about that? Have you ever been tearing out a wall or getting a room a found something kind of cool stuck in the wall or behind something. That’s what happened to a demolision man from England as he was stripping out a house where Lord Of The Rings author J.R.R. Tolkien used to live. Stephen Malton, who runs Prodem Demolition in Bournemouth on the south English coast, was working in the house in the nearby town of Poole before it was bulldozed to make way for a new construction project. “Before we demolish a house we do an internal strip out,” Malton said. “One of the main features was a fireplace, and upon removing that we came across three postcards. The third one was a postcard dated 1968 and addressed to J.R.R. Tolkien.” That would be so cool. Malton said research on the Internet suggested that the carved wooden fireplace with marble inlay, a feature of the house when Tolkien lived there from 1968 to 1972, was already worth up to $250,000. “To tie in both the fireplace and the postcard, we are talking about a price of around $500,000 for the combined pair.” That would be even cooler. That’s one heck of a payday. The postcard was addressed to Tolkien at the Miramar Hotel in Bournemouth, where he and his wife Edith often stayed. It is from “Lin,” which Malton believed could be fellow fantasy author Lin Carter who wrote “Tolkien: A Look Behind ‘The Lord of the Rings,'” published in 1969. He also helped finish writing the Robert E. Howard, Conan series along with L. Spraque DeCamp, as well as wrote dozens of fantasy stories of his own. Depicting a scene from Ireland, it reads: “I have been thinking of you a lot and hope everything has gone as well as could be expected in the most difficult circumstances.” This is an immense find for fantasy collectors. Malton was not sure what the “difficult circumstances” might be. Tolkien had achieved fame by the time he moved to Poole in 1968. He remained in Poole until his wife’s death, when he moved back to Oxford. Tolkien died in 1973, aged 81. Now for a bit of culture? from the other side of the world. Below is a link to a music video by a Russian metal band called ANJ. It portrays a battle axe wielding Mikhail Gorbachov fighting a legion of Zombies, saving Mother Russia and bringing western culture to the zombie besieged country. The video is hilarious and a lot of fun. Check it out for some fun Russian humor. 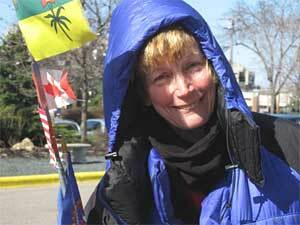 ROSIE SWALE POPE HAS NEARLY RUN AROUND THE WORLD! OK, here’s another bad idea from the chapter on “what I shouldn’t do when I propose.” Chen Lee proposed to his fiancee with a ring hidden in a cake. He thought it would be romantic, original, clever. Not. But Wang Lu, 26, stole a nibble when he wasn’t looking and ate the ring. Oops, fortunately diamonds, don’t digest. “She was quite angry at first and said I was stupid,” said Chen, of Fujian province in China. “But once the doctors had taken the ring out she forgave me and said she would marry me.” Nothing like a little emergency room treatment to up the romance level. Alls well that doesn’t have to be digested. Picture this, you’re out on parole and you have to report to your parole officer. How do you get there? Walk? take a bus? How about a stolen car? Well, that’s what Marcus George of Pine Bluff, Arkansas did. He was released on parole last week on, yep, you guessed it, burglary and theft convictions. George and a friend went to a Pine Bluff dealership, where they took a Toyota on a test drive and didn’t return it. i wonder how long the salesman stood there before he realized he’d been duped? The pair also reportedly stole a Dodge Charger from a dealership in Sherwood, which incidentally was the car George was driving when he showed up to meet with his parole officer in Pine Bluff. At least he had good taste in cars. A charger, cool. George was immediately arrested at the parole office. Not so cool. Oh well, it’s better to keep people that stupid off the streets anyway. You almost have to wonder, which comes first the chicken or the egg. Particularly in this case. Does science fiction spawn the ideas that become science fact or would we have gotten there anyway and the fiction writer was able to envision the future. It’s an interesting premise, but right now a company called IRobot, famous for having created the household robot sweeper has teamed up with a company called Metal Storm, known for their creation of the million rounds per minute gun, to create a robot that will go in ahead of soldiers and robotically clean out the enemy. The as yet unnamed war bot is being marketed for “border patrol” and “crowd control” scenarios, although other military situations are also under consideration. Using these things for crowd control is a frightening application. “We want our soldiers to have the option of controlling a robot that could go ahead and investigate, engage or deter an enemy and not put human soldiers at risk,” said a spokesman for Metal Storm who wished to remain anonymous. The Metal Storm/iRobot robot can be equipped with a variety of weapons, from non-lethal rubber bullets to grenade launchers. As many as 12 different Metal Storm weapons can be put onto the iRobot platform at the same time, said a Metal Storm spokesman. Does it say “I’ll be back?” or “Hasta la viesta, baby?” This new war bot will likely soon join the existing ranks of military robots deployed in Iraq and Afghanistan. The U.S. military has used various war bots, from both iRobot and its competitor Foster-Miller, for years, primarily to diffuse bombs and other unexploded ordinances. Next thing you know we’ll be hearing about a new computer system called Skynet. Why am I getting a shiver up my spine? A video has been released showing Amy Winehouse in a crack dive singing racist songs. Now this isn’t much of a revelation since most of us already knew she was on crack. The interesting thing about his video is that she may be prosecuted for it. The video which was filmed by her husband Blake in 2007, currently in jail, showed the troubled singer sitting by a table, spread with what has been reported as heroin and drug paraphernalia. Actually, I’m surprised she hasn’t used it in one of her music videos. “Why I’m not going to rehab no, no, no.” This evidence has come into light just days after Britain’s top police officer, Sir Ian Blair, called for celebrities caught snorting drugs on camera to be put on trial. Since the evidence is so ovewherlming in Winehouse’s case she may become a test for Blair’s theory. “My position is that a sensible jury would not expect people to be sniffing talcum powder.” Recently the star has been getting publicity as going to rehab and getting her life back in order, though I for one am not buying her reformed attitude. The video shows exactly how much of a disaster she is. But this new kink in the life of bizzarro Amy certainly could put her back into tailspin mode. She has been making noise about wanting to be a mommy so she can join the ranks of Michael Jackson and Brittney Spears as disfuntional celebrities that should never be allowed to reproduce. Can you see her and Blake trying to raise a kid. It makes you shudder. BROKEBACK MOUNTAIN – THE OPERA? Here’s a genius concept. Let’s turn Brokeback Mountain into an opera. Yes, plans are in the works to convert the academy award winning film into an opera. I can hardly wait, singing cowboys, yuck. The New York City Opera commissioned Charles Wuorinen to compose an opera based on “Brokeback Mountain,” the 1997 short story by Annie Proulx. “Ever since encountering Annie Proulx’s extraordinary story I have wanted to make an opera on it, and it gives me great joy that Gerard Mortier and New York City Opera have given me the opportunity to do so,” Wuorinen said in a statement. They’re aiming for a release date of 2013. Hey aren’t people saying the world will end in 2012? Well maybe that’s the bright side to that, we won’t have to put up with this opera. I’m not sure how good of an idea this is. Hanuman, the popular god known for his strength and valor, has been named official chairman of the recently opened Sardar Bhagat Singh College of Technology and Management in northern India, a school official said Saturday. Has anyone looked at his resume. He’s a monkey god! Monkeys like mischief, not business. “It is our belief that any job that has the blessings of Lord Hanuman is bound to be a success,” said Vivek Kangdi. Blessing, yes, actually running the show, not well thought out. The position comes with an incense-filled office, a desk and a laptop computer. Four chairs will be placed facing the empty seat reserved for the chairman and all visitors must enter the office barefoot, said Kangdi, the school’s vice chairman. It seems to me it is going to make it awfully hard to get any decisions here. “When we were looking for a chairman for our institution, we scanned many big names in the field of technology and management. Ultimately, we settled for Lord Hanuman, as none was bigger than him,” Kangdi said. I think next time they should consider an employment service. Though I expect the monkey god works for bananas. Donovan McGowan lived with the piece of metal inside him for three months after an operation. You would think he’d have done something about this sooner. It’s not like you can’t notice this. 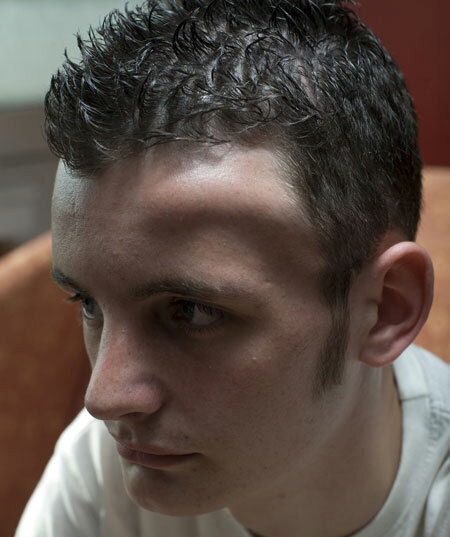 The 18-year-old suffered from blinding headaches and also had an unsightly lump on the side of his head. Eventually, he demanded a scan and it was then doctors found the bar. Duh, It’s right there. They said, “This is quite embarrassing but there is something metallic like a tube still in your head. It’s been more than embarrassing for me having to walk about with this lump,” said Mr McGowan, from Glasgow,Scotland. I bet it made it hard to pick up girls. The rod was left behind during an operation at Southern General Hospital, Glasgow, in March after he was hit by a car. From his picture he looks like still has part of the fender in his head.